About 4.5 million U.S. residents are bitten or attacked by dogs every year, so it’s good to know how to prevent a dog attack. Almost 1 in 5 people require medical care after a dog bite, says the American Veterinary Medical Foundation. Of these approximately 900,000 people who get treatment, half or more are kids. Children are the most common victims of dog bite, and they are also injured worse when dogs attack them than when dogs attack adults. And, says the AVMF, most dogs that bite kids are familiar to the children. “There are many things you can do to avoid dog bites, ranging from properly training and socializing your pet to educating your children on how—or if—they should approach a dog. Information and education are the best solutions for this public health crisis,” says the foundation at its website. “How do you avoid getting bit by a dog? Start by being polite and respecting the dog’s personal space. Never approach an unfamiliar dog, especially one who’s tied or confined behind a fence or in a car. Don’t pet a dog—even your own—without letting him see and sniff you first. Dogs give off certain signals when they may be about to bite, the Humane Society says, including tensing the body, stiffening the tail, pulling back the head and/or ears and furrowing the brow. Other signs of canine aggression include rolling the eyes, yawning, flicking the tongue, staring and backing away. Do not scream and run. Do not make eye contact with the canine. Stand still, do not move, and keep your hands by your sides. When the dog loses interest, slowly back away until you can’t see it anymore. If these don’t work and the dog attacks, present your purse, jacket, book bag, bicycle or anything you have to put between the dog and you. If you fall down, you should curl into a ball, put your hands over your ears and don’t move. Do not roll around or scream. Spay or neuter it. 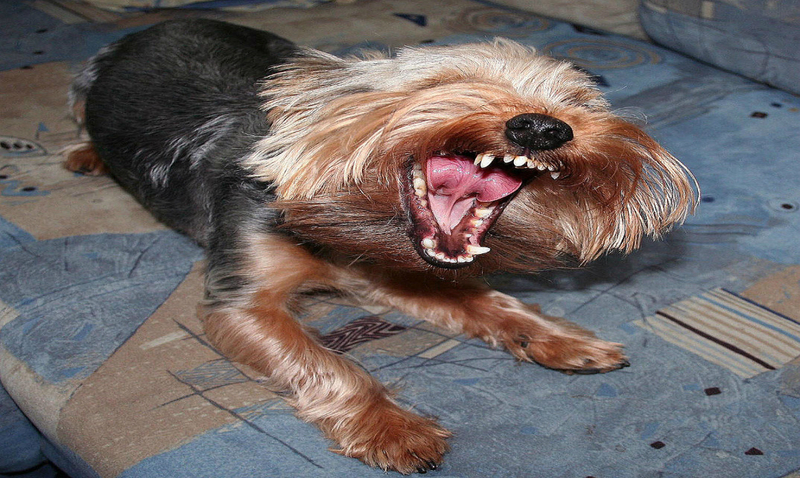 A neutered dog is much less likely to bite or be aggressive. Socialize your dog by introducing it to many different types of people and social situations. This may help reduce their nervousness and keep them from being frightened and feeling threatened, which can spark aggression. Train your dog, but don’t send it away for training. Attend class with the dog, and involve the entire family in the training process. Never teach your dog to chase or attack others or be aggressive in any way, even in fun. Don’t leave your dog tied to a chain, and don’t leave it alone for a long time. They may become dangerous. Get your dog vaccinated regularly. If it does bite someone, at least the possibility of a rabies infection will be eliminated with regular vaccinations. If you or someone you know gets bitten, as soon as possible wash the wound thoroughly with warm water and soap. Then contact a doctor for further advice. Also, inform the local animal control agency about the bite, and report everything you know about the dog and the attack, including the owner’s identity and address. If a stray bites, tell animal control what the dog looks like, where you were when it bit you and which direction it took after. 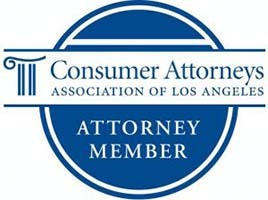 As Krasney Law Center of San Bernardino has written on this blog before, California has a strict dog-bite liability law that places the blame and liability on dog owners, even if the dog had not bitten before. People who suffer dog bites may be scarred emotionally and physically. In addition they may get an infection that requires quick medical care. Some of the diseases spread by dog bites include rabies, MRSA and tetanus, says an article on preventing dog bites from the U.S. Centers for Disease Control. Also, injuries can be severe enough to require stitches or surgery, sometimes even expensive reconstructive surgery. People bitten by dogs also may suffer emotional distress, including nightmares and fear of dogs. The pain and suffering of the bite as well as the emotional distress can be overwhelming. Medical expenses and loss of earnings are of great concern. The type of full monetary recovery that Krasney Law Center seeks for our dog-bite clients can include medical expenses, compensation for emotional pain, lost earnings and pain and suffering. Call Krasney Law of the Inland Empire and San Bernardino at (909) 380-7200 to arrange a free consultation with an expert in the area of California dog-bite and personal injury law. And don’t forget, if we can’t recover any money for you then there is no fee. 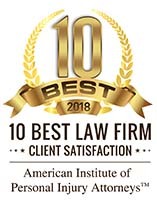 We will discuss the facts of your case, the law concerning dog bites, how to proceed with an insurance company and whether you should bring legal action.